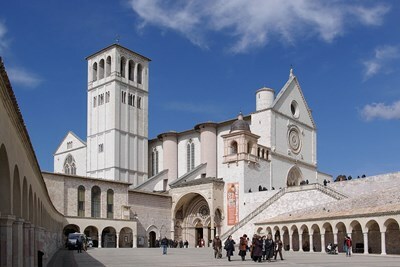 The Papal Basilica of St. Francis of Assisi (Italian: Basilica Papale di San Francesco, Latin: Basilica Sancti Francisci Assisiensis) is the mother church of the Roman Catholic Order of Friars Minor—commonly known as the Franciscan Order—in Assisi, Italy, the city where St. Francis was born and died. The basilica is one of the most important places of Christian pilgrimage in Italy. With its accompanying friary, the basilica is a distinctive landmark to those approaching Assisi. This description uses material from the Wikipedia article on Basilica of San Francesco d'Assisi and is licensed under the Creative Commons Attribution-ShareAlike License (view authors). 6 people want to do this.